It has long been believed that vitiligo is an autoimmune disease. And while there are many theories of this disease process, which include cytotoxic and hereditary, there is another approach, which has yet to be considered. This paper will present a neuroendocrine hypothesis to why vitiligo occurs. With the understanding of the tyrosinase enzyme, tyrosine kinase activity, and the Melanocytic Stimulating Hormone (MSH-α) and its effect on melanocyte production, an alternative approach to vitiligo should be considered, and it begins in the brain. Vitiligo is an acquired cutaneous disorder of pigmentation, with an incidence of 0.5% to 2% worldwide which, manifests as white macules on the skin (Figure 1) and can cause significant psychological stress and stigmatization [1,2]. Recent data provide strong evidence supporting an autoimmune pathogenesis of vitiligo .Current advances have shed light on key components that drive disease onset and progression as well as therapeutic approaches. Vitiligo can be triggered by stress to the melanin pigment-producing cells of the skin, the melanocytes. The triggers, which range from sunburn to mechanical trauma and chemical exposures, ultimately cause an autoimmune response those targets melanocytes, driving progressive skin depigmentation . 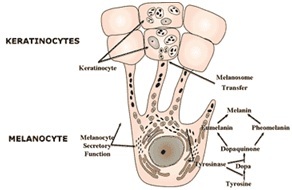 According to published research, the adenylate cyclase signaling pathway, the stimulation of protein kinase C via DAG and the tyrosine kinase activity mechanism (Figure 2) are responsible for the proliferation of melanocytes in mammals . The etiology of vitiligo is poorly understood. The present dogma suggests that genetic factors render the melanocyte fragile thus predisposing individuals to develop vitiligo . Vitiligo can be triggered by stress to the melanin pigment-producing cells of the skin, the melanocytes (Figure 3). The triggers, which range from sunburn to mechanical trauma and chemical exposures, ultimately cause an autoimmune response those targets melanocytes, driving progressive skin depigmentation. The most significant progress in our understanding of this disease’s etiology has been made on three fronts: (1) Identifying cellular responses to stress, including antioxidant pathways and the Unfolded Protein Response (UPR), as key players in disease onset, (2) Characterizing immune responses that target melanocytes and drive disease progression, and (3) Identifying major susceptibility genes. The current model for vitiligo pathogenesis postulates that oxidative stress causes cellular disruptions, including interruption of protein maturation in the Endoplasmic Reticulum (ER), leading to the activation of the UPR and expression of UPR-regulated chemokines such as Interleukin 6 (IL-6) and IL-8. These chemokines recruit immune components to the skin, causing melanocytes to be targeted for destruction. Oxidative stress can further increase melanocyte targeting by promoting antigen presentation. Two key components of the autoimmune response that promote disease progression are the Interferon (IFN)-γ/CXCL10 axis and IL-17-mediated responses. Several genome-wide association studies support a role for these pathways, with the antioxidant gene NRF2, UPR gene XBP1, and numerous immune-related genes including class I and class II major histocompatibility genes associated with a risk for developing vitiligo . The α-melanocyte stimulating hormone is under hypothalamic control, and is released by the anterior pituitary gland (Figure 4). In turn, the α-Melanocyte Stimulating Hormone (alpha-MSH) in mammals is responsible for stimulating the adenylate cyclase and tyrosine activity binding to normal human melanocytes via high affinity receptors and stimulating melanocyte proliferation . Given this, one feels compelled to ask: what would happen if these signaling pathways were defunct? In other words, can the abnormal proliferation of melanocytes, which we see in vitiligo be attributed to altered α-MSH signaling pathways? Tyrosinase is an enzyme controlled by the initial actions of the hypothalamus. Tyrosinase is an important enzyme in mammalian melanin synthesis. The pigment is produced in two different cell types: the pigmented epithelial cell of the retina, and the melanocyte, a cell of neural-crest origin . The peripheral organ that the hypothalamus influences physiologically is the skin. Consequently, if the hypothalamus is not working efficiently, then it is possible production of tyrosinase will be deficient, thus preventing the catalysis of tyrosine to melanin. 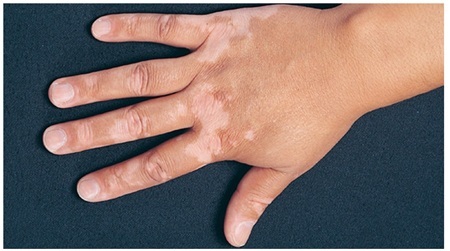 Tyrosinase is known to be involved in vitiligo via the TYR gene. And while studies have shown that impaired tyrosinase leads to oculocutaneous albinism one asks what are the implications of this enzyme or lack thereof, which is present in melanocytes in people suffering from vitiligo . One further hypothesizes, if tyrosine kinase, an important protein kinase involved in signal transduction and inflammatory response, is also impaired, there must also be a deficiency in the function of the hypothalamus. Thus one must do further research to understand the role of the hypothalamus, and its effect on tyrosinase production. According, to Schwahn et al., Melanocyte Stimulating Hormone (alpha-MSH) increases cytosolic levels of cAMP as well as tyrosinase activity in murine melanocytes . Their results indicated that tyrosine levels can regulate the proliferative activity induced by alpha-MSH, as well as the extent of melanogenesis in normal human melanocytes. The significance of this work is that tyrosine levels may be part of the mechanism that switches melanocytes out of a proliferative status and into a melanin-synthesizing, terminally differentiated phenotype . One must also consider MITF, or melanogenesis associated transcription factor, which contains an encoded protein that regulates melanocyte development and is responsible for pigment cell-specific transcription of the melanogenesis enzyme genes . MITF is a transcription factor that activates the transcription of tyrosinase and Tyrosinase-Related Protein 1 (TYRP1); an enzyme that is specifically expressed in melanocytes . Albeit tyrosinase is not directly controlled by the hypothalamus and is regulated by MITF, hypothalamic influence on this enzyme allows for one to surmise a neurological theory in its involvement with vitiligo. Research shows mutations in the MITF at germ line will lead to syndromes with pigmentary defects. If we study MITF regulation, of the tyrosinase enzyme, which is influenced by hypothalamic control, in persons with vitiligo, we expect to see a neuroendocrine link, thus better helping us to understand the etiology of vitiligo. Thus, the link for tyrosine and alpha-MSH is integral for vitiligo and understanding its etiology; as alpha-MSH is a hormone and tyrosinase is an enzyme that plays an important role in melanogenesis (Figure 5) - a process, which begins in the brain, supporting the neuroendocrine theory for vitiligo etiology. Alpha-MSH and tyrosinase are significant in the melanogenesis process. While this hormone and enzyme, respectively are not the sole justification for vitiligo, it is important we study their neurological origins and how deficiencies in their function, can impact depigmentation in mammalian skin, in patients with vitiligo. Studying the regulation of tyrosinase, which is done by MITF, will also help us understand this enzyme’s role in impaired melanogenesis in vitiligo patients. As research has shown us, mutations in the MITF at germ line will lead to syndromes with pigmentary defects. Thus, there is a link between tyrosinase and pigmentary defects a link that needs to be researched with respect to the pigmentary defects in the disease vitiligo. While tyrosine kinase alone is not the sole pathway responsible for helping us understand depigmentation of skin in persons with vitiligo, by doing further research on how synergistically this pathway impacts impaired melanogenesis in vitiligo will only help bring clarity to the etiology of this disease. Understanding the signaling pathways, hormones and enzymes behind melanogenesis will improve our understanding behind pigment loss disorders like vitiligo and Idiopathic Guttate Hypomelanosis (IGH), thus impacting current treatments of these conditions. In addition, how we perceive autoimmune disorders overall can be further evaluated and perhaps a more definite etiology can be discovered. This will impact how we treat autoimmune diseases and allow for improved and novel medications to aid in the quality of life of the patient, both physically and emotionally. Although more research is needed on the neuroendocrine theory behind vitiligo, it is a possibility. Ghafourian A, Ghafourian S, Sadeghifard N, Mohebi R, Shokoohini Y, et al. (2014) Vitiligo: symptoms, pathogenesis and treatment. Int J Immunopathol Pharmacol 27: 485-489. Mayo Clinic (2018) Vitiligo. Mayo Clinic, Rochester, Minnesota, USA. Manga P, Elbuluk N, Orlow SJ (2016) Recent advances in understanding vitiligo. F1000Res. De Luca M, Siegrist W, Bondanza S, Mathor M, Cancedda R, et al. (1993) Alpha melanocyte stimulating hormone (alpha MSH) stimulates normal human melanocyte growth by binding to high-affinity receptors. J Cell Sci 105: 1079-1084. D'Agostino G, Diano S (2010) Alpha-melanocyte stimulating hormone: production and degradation. J Mol Med (Berl) 88: 1195-1201. Boissy RE, Manga P (2004) On the etiology of contact/occupational vitiligo. Pigment Cell Res 17: 208-214. DermaMedics Professional (2018) Hyperpigmentation: An Overview of Human Pigmentation. DermaMedics Professional, Oklahoma, USA. Tief K, Hahne M, Schmidt A, Beermann F (1996) Tyrosinase, the key enzyme in melanin synthesis, is expressed in murine brain. Eur J Biochem 241: 12-16. National Institutes of Health (2018) Oculocutaneous Albinism. Genetics Home Reference, US National Library of Medicine, National Institutes of Health, Bethesda, Maryland, USA. Schwahn DJ, Xu W, Herrin AB, Bales ES, Medrano EE (2002) Tyrosine Levels Regulate the Melanogenic Response to α‐Melanocyte‐Stimulating Hormone in Human Melanocytes: Implications for Pigmentation and Proliferation. Pigment Cell Res 14: 32-39. Riddle ND, Zhang P (2018) MITF (microphthalmia-associated transcription factor). Atlas Genet Cytogenet Oncol Haematol 17: 735-739. Wolff K, Goldsmith L, Katz S, Gilchrest B, Paller AS, et al. (2011) Fitz­patrick’s Dermatology in General Medicine (8thedn). McGraw-Hill, New York, USA. Figure 1: Vitiligo is a condition in which the skin loses its pigment cells (melanocytes). This can result in discolored patches in different areas of the body, including the skin, hair, retina and mucous membranes . Melanins are large bio aggregates composed of pigmented precursors originally derived from the amino acid tyrosine. 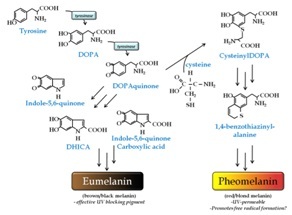 Epidermal melanins are present in two major forms: (1) Eumelanin, an effective UV-blocking brown/black pigment and (2) Pheomelanin, a sulfur-containing red/blonde pigment less able to absorb UV photons. The Melanocyte Stimulating Hormone (MSH) - Melanocortin 1 receptor (Mc1r) signaling axis is a major determinant of the type and amount of melanin produced by melanocytes in the skin . Figure 3: The image shows a melanocyte and the production of melanosomes . 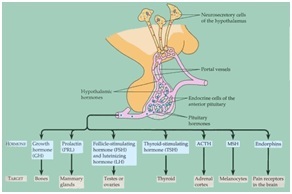 Figure 4: Neurosecretory cells in the hypothalamus release hormones that travel through a portal system to the anterior lobe of the pituitary, where they either inhibit or encourage the release of a wide range of hormones from the pituitary, including Melanocyte Stimulating Hormone (MSH), which causes a dramatic darkening of skin by increasing the production of the dark pigment melanin in skins cells called melanocytes . 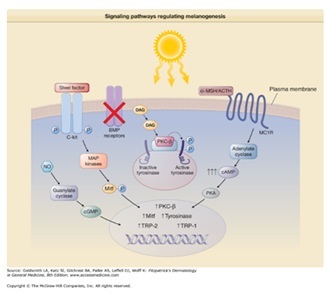 Figure 5: Signaling pathways regulating melanogenesis . Citation: Cush ZM (2018) A Neuroendocrine Theory for the Etiology of Vitiligo. J Med Stud Res 1: 007. Copyright: © 2018 Cush ZM. This is an open-access article distributed under the terms of the Creative Commons Attribution License, which permits unrestricted use, distribution, and reproduction in any medium, provided the original author and source are credited.